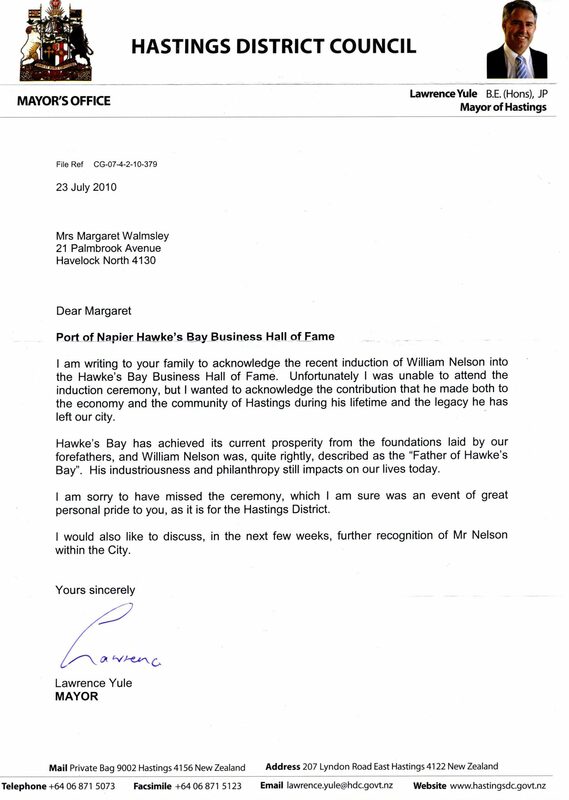 I am writing to your family to acknowledge the recent induction of William Nelson into the Hawke’s Bay Business Hall of Fame. Unfortunately I was unable to attend the induction ceremony, but I wanted to acknowledge the contribution that he made both to the economy and the community of Hastings during his lifetime and the legacy he has left our city. Hawke’s Bay has achieved its current prosperity from the foundations laid by our forefathers, and William Nelson was, quite rightly, described as the “Father of Hawke’s Bay”. His industriousness and philanthropy still impacts on our lives today. I am sorry to have missed the ceremony, which I am sure was an event of great personal pride to you, as it is for the Hastings District. I would also like to discuss, in the next few weeks, further recognition of Mr Nelson within the City.